This is the first one of the collection that I am swatching. 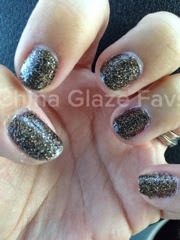 It's 1 of the 2 glitters that are found in the collection and it is meant to be worn on its own. It's does go on quite thick, and of course, 2 coats are needed. I used 2 coats of Seche Vite on top and you can't feel any of the texture. I'm not really a fan of glitter polish, but I honestly really like this one! !